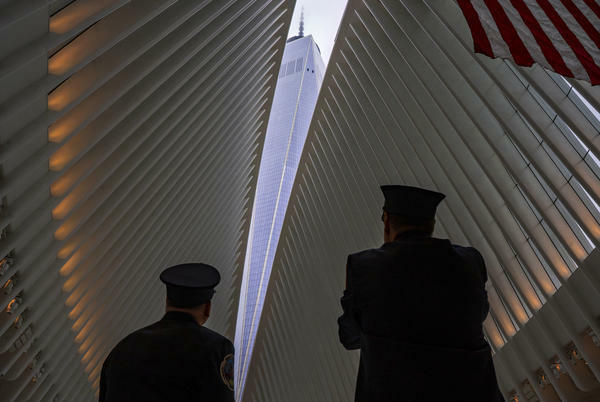 Thousands of people came together today in New York at the Memorial Plaza where the twin towers of the World Trade Center once stood. SHAPIRO: ...And the recitation of names of those who died that day. UNIDENTIFIED PERSON #1: Diane Hale-McKinzy. UNIDENTIFIED PERSON #2: Richard B. Hall. September 11 still influences our everyday experiences with the increased security checks and protocols that began after that day. And it still influences how the U.S. engages with the rest of the world. Perhaps our best understanding of the 9/11 attacks and the events leading up to it comes from a commission. GEORGE W BUSH: This commission has been charged with a crucial task. To prevent future attacks, we must understand the methods of our enemies. SHAPIRO: The 9/11 report came out in 2004. The commission co-chairs were Tom Kean, Republican former governor of New Jersey, and Lee Hamilton, Democratic former congressman of Indiana. The two of them now have a new report sponsored by the U.S. Institute of Peace. It looks at how extremism has evolved in countries with fragile governments in Africa and the Middle East. CORNISH: The report details how countries including China, Russia and Iran are making inroads in those fragile states and why that's leaving the United States in a weaker position. SHAPIRO: Governor Tom Kean and Congressman Lee Hamilton, welcome back to ALL THINGS CONSIDERED. TOM KEAN: Thank you very much. SHAPIRO: The report gives some interesting examples of places where Russia and China have used American absence to step in and become important players in places like Africa. China is Africa's largest single country trade partner and biggest creditor, you write. You tell the story of Moscow supplying weapons to Nigeria when the U.S. wouldn't because of human rights concerns. KEAN: Yeah, that's true. And we also believe that we've got - as rich as we are, we're limited in our resources. If we're spending billions on military efforts to try and contain terrorism in Syria, we're not spending the same money to help us economically and become influential those areas. We just can't do both. And this - what we're proposing here, which is strengthening these fragile states, is an awful lot cheaper than using our troops. And we think it's not only cheaper, but it's going to be more successful. So what we're recommending is a whole change in American policy where we recognize that our troops have done a wonderful job and occasion - still we're going to have to use them. But where possible, we want to get into these fragile states and give the people some hope. SHAPIRO: Does trying to reshape society raise some warning flags? If you're talking about trying to make societies more democratic, more liberal, more like the United States, that sounds like a level of meddling in foreign affairs that would make some people very uncomfortable. HAMILTON: I think that overstates what we're trying to do. We are not trying to engage in nation building. What we are trying to do is to strengthen fragile states. We're not naive about this. We try to be realistic. But what we can do, as Tom has emphasized, is to try to help vulnerable countries, societies better resist extremism. Now, how do we do that? The key, in a word, is to improve governance, to reduce corruption, to reduce repression because where you have corruption, governments that don't meet the needs of their people, you have the breeding ground for extremism. SHAPIRO: In your view, what role has U.S. policy since 9/11 played in the increasing chaos and extremism that you describe? I mean, do you think the U.S. involvement in Iraq, Afghanistan, Libya, Syria, Yemen - it's a very long list - has made things better or worse? KEAN: Well, it depends on the time, depends on the country. We've made some mistakes. No question about that. And what we're recommending here is a far different policy and one that doesn't do things to people but works with people. Countries need to supply infrastructure for their people. People need to get clean water. People need to have all those things that we're used to. SHAPIRO: But the U.S. has invested in putting a lot of those things in place in, for example, Afghanistan, and a lot of those things were blown up. KEAN: Well, that's true. But that's why you got to get - (laughter) you got to do it in places that aren't already engaged necessarily in war. A lot of these fragile states here are unstable because they don't have a government that works with their own people. We're talking about coming into those areas, working with the people, helping to establish governments that can serve people's needs. By the way, al-Qaida wants to do that now. And we think you can do that better through legitimate government supported by the people. SHAPIRO: Sounds like a very oversimplified version of what you're saying is focus on the State Department more than the Pentagon. KEAN: Well, in a way, but look; let me give an example of what can happen. As you know, the largest Muslim country in the world is Indonesia. When we polled in Muslim countries after 9/11, we had about a 20 percent popularity in the United States. Eighty percent of the people didn't really like us. Well, as you remember, years ago Indonesia had that tsunami. We sent in a lot of aid. We sent in former President Bush and President Clinton as a team. United States was very visible. After we had done that, we had a popularity rating of 70 percent. Seventy percent of the people liked the United States. Now, that's a lot cheaper than war. SHAPIRO: And at the same time, Saudi Arabia's opening a lot of free universities in Indonesia. KEAN: They are. They are. HAMILTON: Look; you say focus more on the state and DOD. I think what we want to say is that you have to use all the tools of American power. Now, we have often turned to the gun quickly, but it is not sufficient by itself. What has to be done is to try to build resilient societies. Now, that is more of a task for the State Department. So I guess what we're saying is you need both of them. We have done pretty well thus far with the military side of it. We've got to up our game with regard to the diplomatic, political, economic side of it. But you're going to need all of these tools. SHAPIRO: What's your assessment of how the Trump administration is approaching these problems? KEAN: We think this may be one of the few things that can bring people together. SHAPIRO: But after a year and a half in office, the "America First" policies of the Trump administration don't seem to be implementing the kinds of priorities that you're talking about in this report. HAMILTON: What we're all about is trying to strengthen those elements that clearly exist in this administration and the previous administration who are sympathetic, who advocate, who are trying to put into effect a preventative strategy. We want to strengthen that and reinforce it. We're not just dealing with one administration. We're dealing with American foreign policy over a period of decades. SHAPIRO: Lee Hamilton and Tom Kean were co-chairs of the 9/11 Commission. Their new report is called "Beyond The Homeland: Protecting America From Extremism In Fragile States." Thanks to both of you. (SOUNDBITE OF FLUGHAND'S "DWARF") Transcript provided by NPR, Copyright NPR.